In our continuing pursuit to best serve you, these two features help make writing Food Safety Plans even easier! 1. Food Safety Expert Services On Demand! Our Food Safety Expert network is composed of food engineers, chemical engineers, food scientists, and others involved in various aspects of food safety. They will partner with you to help you write your food safety plans and perform your hazard analysis. They can help ensure that your facility’s Good Manufacturing Practices (Code of Federal Regulations 117) are compliant. ConnectFood Expert Partners such as Process Authorities can help evaluate the worst-case parameters of your processing equipment. There are so many risk based variables to assess, and a food safety expert help will make sure you are addressing all of them to keep your food product manufacturing process safe and compliant with Food and Drug Administration and United States Department of Agriculture regulations. For a more detailed description of each service, be sure to login with your account and navigate to “Expert Services”. If you are a Food Safety Expert and would like to join ConnectFood’s partner network, please contact us here. Also included in this major release is a Sanitation SOP and SOP library. These are templates that you can import into your own list of SOPs to modify in order to save you time and start you off with some guidelines. Well written Sanitation SOPs are the foundation of a good sanitation program. A sanitation program will include training records, Sanitation SOPs, and monitoring of sanitation preventive controls. The ConnectFood SOP library is consistently growing the the number of templates available is a part of our Premium level subscription plan. Sign up today to gain access to this valuable feature! Congratulations! You are looking for expert help in writing a food safety plan, and you found ConnectFood. ConnectFood developed software for an on-line food safety plan builder with you in mind, every step of the way. You are not alone. Behind the screen there is a cadre of food safety experts to help you. Through our knowledge, experience, and connections, we can help you write your food safety plan quickly. I have known Matthew Botos, CEO of ConnectFood, since 2000. I know Matthew to work tirelessly for the food industry, to travel worldwide for training and helping the food industry, and to network with government agencies from local to federal. FDA recently published their on-line food safety plan builder for food manufacturers. Like usual, FDA is late to the party and behind industry. I have worked alongside some fine people at FDA. They work hard to steer a huge, government system. Like the Titanic, reaction time is slow and often too late. ConnectFood has been working with the food industry to write food safety plans for over three years. My biggest concern for companies writing their food safety plans is getting their questions answered in a timely fashion. FDA has a Technical Assistance Network (TAN) which will answer questions on the rule only. Don’t expect an answer within 24 hours. At FDA pace, it would take months to write a single food safety plan. If the question is outside the realm of the rule, companies will be referred to the Food Safety Preventive Controls Alliance (FSPCA) TAN. Matthew, ConnectFood Experts, and I have access to members of the FSPCA TAN too. Getting questions answered is one of the reasons that a Preventive Controls Qualified Individual (PCQI) is required to supervise the writing of a food safety plan. Do you know who is a PCQI? Matthew Botos, CEO of ConnectFood, and I are. Not only are we PCQIs, but we are also Lead Instructors of the workshop for PCQIs. Matt Botos also is a Trainer of Trainers. Collectively, we have delivered over 50 PCQI workshops since the end of 2015. It is pretty safe to say we know the rule. Matthew is a food engineer, and I am a food microbiologist. Along with our network of food safety experts, ConnectFood has you covered. The ConnectFood software is a cost-effective method to get your food safety plan written. ConnectFood continues to develop cutting-edge easy-to-use software for an on-line food safety plan builder that can be used to showcase food safety either on-line or printed out to be shared with clients or regulators. ConnectFood is not just for food manufacturing. Restaurants are using the ConnectFood software to build their Hazard Analysis and Critical Control Points (HACCP) plan. While the application is a bit different, the process of building a HACCP plan is the same. ConnectFood is the perfect solution for chefs and our foodservice friends: restaurant food safety could look like HACCP, the important part is to know your product, ask yourself if you have any hazards, and have a good safety plan!. September 8, 2017 /by Kathy Knutson, Ph.D.
https://connectfood.com/wp-content/uploads/2017/08/Blog-Image-How-Do-I-Write-a-Food-Safety-Plan.jpg 4548 6755 Kathy Knutson, Ph.D. https://connectfood.com/static/graphics/ConnectFood_logo_food_safety_plans_made_easy-300.png Kathy Knutson, Ph.D.2017-09-08 17:54:572017-09-08 18:35:05How Do I Write a Food Safety Plan? 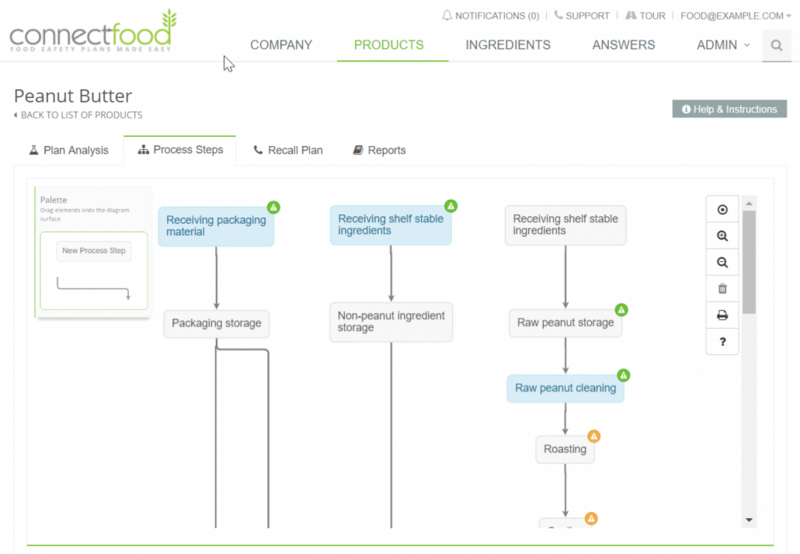 Announcing the major release of the process flow drawing capabilities to help make Food Safety Plans even easier! In the continuous pursuit to make the complex task of developing Food Safety Plans simpler, the ConnectFood team has developed an easy to use, drag and drop visual designer. A process flow allows a facility to design the ‘story’ to tell regulators and inspectors how a food product is made. The process flow has visual indicators on process steps that signify which process steps have hazards, critical limits, and ingredients. Users can navigate to each of these entities from the process flow. Why is a process flow diagram important? Where product is diverted to waste, if applicable. Since the accuracy of the process flow is critical to conduct a hazard analysis, the steps outlined in the chart must be verified at the plant. If a step is missed, a food safety hazard requiring a preventive control may be missed. Include every handling, processing and holding step for the product, as well as ingredients and packaging. The food safety team should walk through the facility and make any changes required in the flow diagram. At the same time, the team should make observations related to sanitation, potential for cross‐contamination or allergen cross‐contact, and potential harborages or introduction points for environmental pathogens. The walk‐through allows each team member to gain an overall picture of how the product is made. It may be helpful to invite additional plant personnel to review the diagram during the walk‐ through. Many times operators can identify issues that may be overlooked by management or the food safety team. The complete, verified flow diagram should be retained and periodically evaluated as a food safety record and part of the Food Safety Plan. Food Safety Plans are dynamic and must be updated to reflect any changes in process or food safety considerations. Therefore, any significant changes to the process must be accurately reflected in the product flow diagram, and the Food Safety Team must evaluate if these changes have an impact on the hazard analysis and preventive controls in place.